Pickles, pickles, pickles, I just love preserving fruit and vegetables this way. 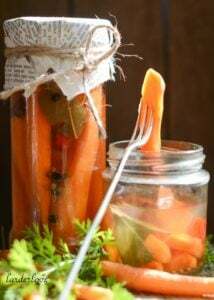 These pickled carrots just sing of spring time and are the perfect addition to salads and sandwiches etc, just watch out Bugs Bunny doesn’t nick them first! Savoury salt is a great addition to your store cupboard/larder and makes whipping up any meal a whole lot faster when your most basic seasoning already packs a punch of flavour. 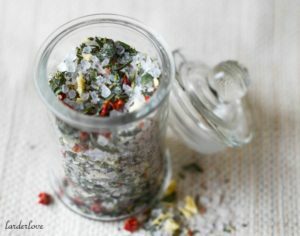 Although you can buy flavoured salts in the shop it is so much better to make your own. Mustard puts a bit of heat and spice into all sorts of things from your traditional Christmas baked ham to grilled cheese sandwiches and my Highlander Mustard is no exception. With a wee dash of whisky it will add that bit of Scottish style to your foodie gifts this Christmas. When you think of relishes and chutney you tend to think of veggies and savoury flavours, well my strawberry and raspberry relish brings a whole new dimension to the relish department, sweet and savoury and delicious! Who doesn’t love using sun dried tomatoes in their cooking. They are packed with amazing flavour and ramp up the tomatoness of any dish from spaghetti sauce to soups and dips. My homemade oven dried tomatoes in oil are the nearest we in the UK can get to the sun dried type.